Incredible View. Steps from the beach. Decorated by a prestigious designer. Completely furnished. Fully equipped kitchen. First level property. Cook`s paradise kitchen. Master bedroom with balcony. Luxurious linens. Ensuite bathroom. Ensuite bathroom. Spacious condo. Large second bedroom King size bed. Sitting area. Courtyard`s view. Hallway bathroom. Unit`s plan. Bahia Ecantada. Oceanfront Community. Beachfront pool. Perfectly manicured grounds. Romantic getaway. Recently remodeled! 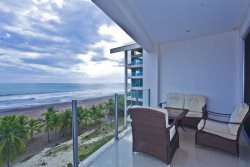 This sleek and stylish two bedroom, two bath condo is located on the ocean view side of the ground floor and comes fully furnished with everything needed to make your dream vacation a reality. You and your guests won't have to go far to take in the beauty of your surroundings or experience the relaxation of lounging in the sun, as this unit features two private patios, with unobstructed views and direct access to the beach and the large, tri-level pool just steps away. The tastefully decorated and spacious living area features comfortable seating, a flat screen TV, and easy access to the dining patio on one side and the kitchen on the other. Whether you want to cook for the family or just entertain a few guests, the kitchen is fully equipped to meet your needs, with full-size stainless steel appliances, granite countertops, elegant wood cabinetry and a large breakfast bar. Other kitchen appliances include a fridge, freezer, dishwasher, oven, toaster, blender, coffee maker and microwave. The master bedroom features a king-size bed, in-suite bathroom, and sliding door access to the dining patio. The guest bedroom is furnished with another king-size bed and is located just down the hall from a full guest bathroom. Modern décor, luxurious linens, plush pillows, and a full-size washer and dryer unit top off the long list of amenities included with this unit. If you're looking for a place to vacation where beauty and luxury meet comfort and convenience, look no further than this unit!